It’s tempting to laugh at the overblown style of acting in most silent films. And those speedy movements that resulted from the old hand cranked cameras often make it appear even more odd. But in the hands of a master like F.W. Murnau, you’re more likely to weep than to laugh at the sheer depth of human emotion conveyed. In his first Hollywood movie, the German director of Nosferatu created a visual poem which he subtitled ‘A Song of Two Humans’. And the story of A Woman (Janet Gaynor) and A Man (George O’Brien) really does sing out from the screen. The couple and their child live in a rural lakeside village where city slickers come to holiday. This particular year, one wanton woman (Margaret Livingston) has lingered to ensnare the Man and lure him back to the Big Smoke. All he has to do, says the vamp in one of the film’s few inter-titles, is to drown his wife first. Bedazzled by her modern charms, the Man takes his sweet little lady off on a boat ride. But when he makes a move for her, the expression on her face stops him dead in his tracks. This is when silence is golden. Watching the monumental realisation slowly dawn across her exquisitely lit face is cinema at its best. And what’s truly remarkable is that from this awfully dark place, the characters move into the light and the sunrise of the film’s title. It’s been 80 years since this fascinating film first flickered in front of audiences and it’s tale of love rekindled still captivates. It won Best Cinematography at the very first Academy Awards ceremony and was also named Best Unique and Artistic Production. 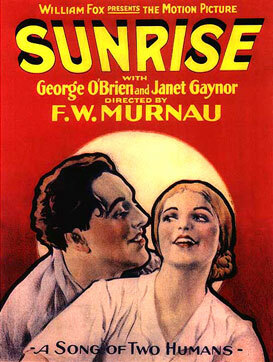 With it’s inventive use of superimposed imagery and matte shots, Sunrise truly is a stand-out.